Try eBay. Look up a seller name alfa1750. If he doesn't have what you need I doubt anyone does. Send him a message he has tons of parts many which are not listed. He also offer great discounts when you but certain amounts. Good luck. Also try piercemanifolds.com. Go to the exploded view of the carb. It has the parts numbers listed. Click on the number of the part you need and you will see if they have it or not. They have more parts than Alfa1750, but Alfa1750 has some parts that piercemanifolds does not have. soooo i need a 13b manifold. Does anyone have one for sale or would like to trade for the RE dual intake manifold off the 12a ? I believe we have a couple spares of both the 12A & 13B DCD manifolds. What are you wanting for the 48IDA setup ? i have since bought a good amount of jets (air and gas) for it and it came with some extra e tubes as well, so there's a lot of stuff that goes with it. To be honest i'd like to get the duals on my 13b before letting the ida go. However if you were interested i could certainly give you first dibs on it? Let me check the carb storage section upon returning to the shop. Feel free to holler if you haven't heard back in a day or so. I also have all the info for jetting changes from 12A to 13B (stock or street port). These work well on a stock port motor but street port is a whole nuther animal. Even with the correct jetting values, there were some tweaks that Rotary Engineering did - such as custom drilling of the emulsion tubes. Very few people actually go to that degree of detail. Nice looking rims. Are they non 13's? Given the limited choice in 13 inch tires, it is just a matter of time when 13 inch tires will disappear. A classic tribute to wire wheels of british sports car when they were worth damn. They WONT be going out of stock being lots of small cars on the road today still use 13" wheels, as well as lots of trailers and even UTV's and large ATV's are using 13" now. Last edited by Sh00bs; 10-10-16 at 03:41 AM. I was referring to mandrake 2661 's picture. The selection is considerably less now. If trends continue, there will just be race track tires. So I could use 13 inch ATV and trailer tires and rims? So I better not use ATV/trailer wheels/rims? Many of those listed on Amazon have "only 2 left" notations. Race track tires take a lot of care and feeding. regardless I think 13" passenger tires will still be available in the next few years and there onward. hey if I needed to get somewhere or push my car around I wouldn't be opposed to putting atv or trailer wheels on the car to move it around. The wheels themselves, ive seen some pretty attractive trailer wheels, tires wouldn't be good for over 70 for the most part from trailers. Atv's,, im JUST saying most atv bolt pattern is 4x110 lol ive never done it but just listing options. 13" are only suitable for mild street use, if that. of a car and the G forces a car would put on them. Last edited by t_g_farrell; 10-13-16 at 12:46 PM. Back to the weber carbs. Can someone pleace give me the exact length of the two choke cables running to each carb from the Y splitter. Mine didn't come with the carbs nor do I know where to purchase it. Pictures would help too! I can measure later today and let you know. 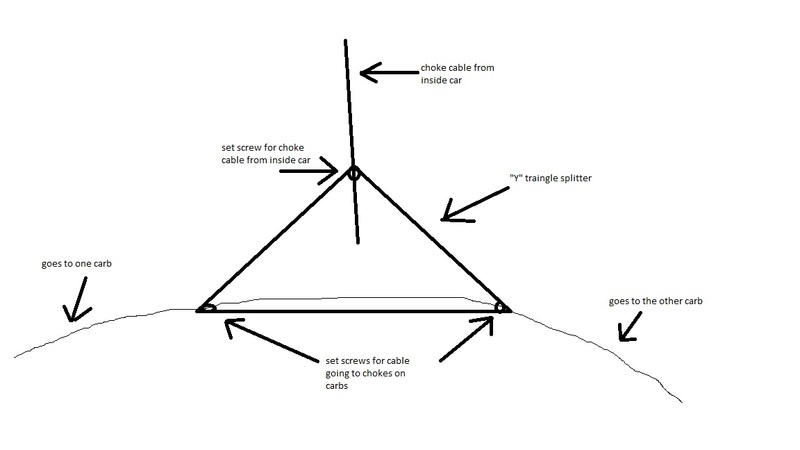 btw, the choke linkage is made up of bicycle cables and some years ago I was able to find the splitter on a bicycle linkage website, maybe this will help you put together the linkage you need. kind of hard to explain w/o pictures, hopefully I described it well enough. Thanks! I'm mainly looking for the length of the two cables where it splits and are they the same length, etc? Pics of how it attaches to the choke levers of each carb wpuld be nice too. Im so interested in those dual webbers , if anyone knows another pair around hit me up. $1000 for racing beat exhaust?! ?